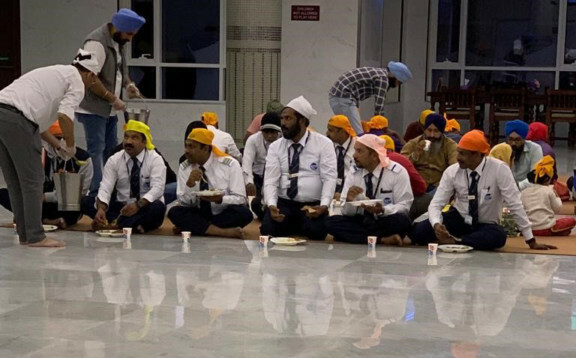 DUBAI: The Sikh Gurudwara Darbar Sahab in Jebel Ali, Dubai, was a picture of tolerance and diversity as hundreds of Muslim bus drivers and the Catholic faithfuls they were ferrying for the Papal mass in Abu Dhabi partook in the langar or free community meals from 4pm onwards on Monday. He said as Catholic faithfuls started arriving to board the buses, many of them also came to the Gurudwara and enjoyed the langar. “Guru Nanak (the founder of Sikhism) always said, irrespective of the communities we belong to, we are all one and the children of God. We must support each other,” said Khandari. He said an average of 1,500 people have langar at the Jebel Ali gurdwara every day, with the number going up to 15,000 during the weekends and over 60,000 during festivities. Langar is a term used in Sikhism for the community kitchen in a Gurdwara where a free meal is served to all visitors, irrespective of their religion, caste, gender, economic status or ethnicity. The free meal is always vegetarian.